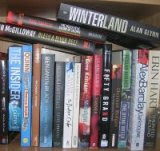 Poke Rafferty is a writer of ‘off-the-beaten-track’ travel guides to South East Asia. He’s settled in Bangkok, taken in a young street girl, Miaow, who he’s trying to adopt, has an ex go-go dancer as a girlfriend, Rose, who has set up her own cleaning business, and is friends with, Arthit, an honest cop serving in a largely corrupt police force. Not long after agreeing to help Superman, Miaow’s friend from the street who has a reputation for being difficult and violent, Raffrety is asked by an Australian woman to find her missing uncle, a long time resident in the city. He reluctantly agrees as a favour to Arthit. His investigation soon leads him to the unsettling and dangerous Madame Wing, who wants him to find the person trying to blackmail her. Given the money on offer, Rafferty agrees. His two cases are seemingly disconnected, but both lead to very dark places. Unable to disentangle himself, he needs to find a solution that administers justice but does not threaten his new family, a task that seems all but impossible. 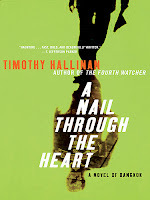 The strength of A Nail Through the Heart is the sense of place and contextualisation; Poke Rafferty is a travel writer in Bangkok and, likewise, Hallinan gives a good Western perspective and explanation of the city and culture. The story, however, suffers from a couple of shortcomings: I did not sufficiently believe in the main character, nor in the plot. Poke Rafferty came across as somewhat schizophrenic – hyper-sensitive and caring to the point of being sappy with his adopted family and certain others, yet hardnosed, threatening, and at times violent with others. He’s either tiptoeing over eggshells or creating them and the two halves felt disconnected. The main two plotlines are interesting and unfold at a good pace, but too many elements are over-contrived and clunky, and there were too many subplots. 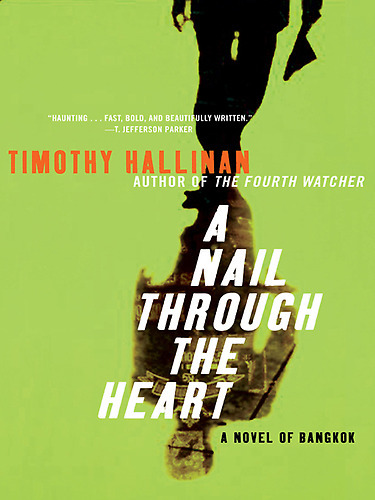 It was if Hallinan decided to try cram as much action and emotive darkness into one story as possible. Sometimes less is more. This was a shame as it’s clear he’s a good writer and the set-up and setting have a lot of promise. Overall, a reasonably entertaining read, and I’d try the next in the series, but this felt over-written.